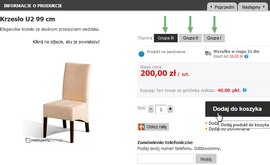 Below we present in few steps explain how to place an order in our store. Guidance is dedicated especially to those customers, who do not normally buy on the internet. 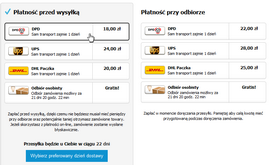 The ordering in MeblujemyDOM is clear and intuitive process with which each can handle without too much difficulty. Add selected products to your virtual shopping cart. When you ordering upholstered furniture in a more expensive fabric, remember to change the price group of the material on the right. All products are assigned automatically cheapest price group. Add to each product information about selected color or enter the name of the fabric with its number and color of the wood, in which we have to prepare furniture. At this stage, you can also calculate the installment for the contents of your shopping cart, if you plan on buying on credit. 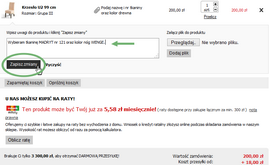 Please make sure to confirm the entered specification for each product in the basket by clicking on "save changes". Even if at this point you do not provide information about the selected colors, you can do it later by typing your choice in the comments to the order. After the approval of the contents of your cart, you can proceed to provide your contact information. 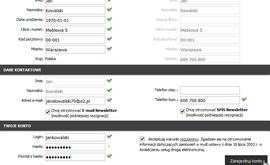 If you are already registered account - sign in. If you want to create an account please use the registration form. You can also place an order without creating an account. Please enter your full contact details in the contact form, which are necessary to fulfill your order. Then go further. Select the preferred method of settlement. You have to choose prepayment or payment on delivery. Remember, if the value of your shopping cart exceeds 600 zł and you choose cash on delivery, you may be askedr an advance payment to order. 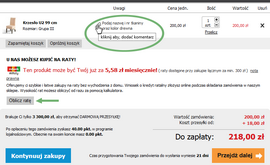 Purchases above 3500 zł provide you for free. After selecting the prepayment will be a list of available forms of payment, like the fast electronic transfers, vouchers or installment purchases. 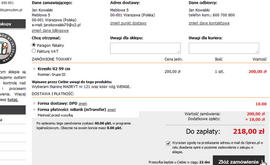 If you do not find in the list of your bank, you can select "normal transfer" or the "pay later". You will then receive an e-mail the data to complete transfer. Validate all data entered. You can also enter additional comments to the order and instructions for the courier. Confirm purchase by clicking the "place order". If you have previously selected the option of electronic transfer or installment purchases, after placing an order, the system automatically redirects you to the site of the bank to make payments or to complete a credit application. If you selected "normal transfer" or the "pay later" is an email you will receive full details for the transfer. After placing your order to your email you receive a message, in which you can find detailed specifications of purchased products, account data for the transfer and a link to confirm your order. When clicked, displays a message about the success of the whole process. If you have trouble making a purchase online, please contact our Customer Service at +48 500 690 691. Please note that apart from order by phone, you can also buy furniture by e-mail. 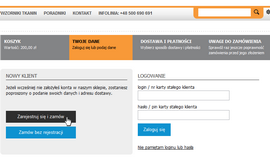 Just send us an email to info@meblujemydom.pl and give details of your order, including contact information.